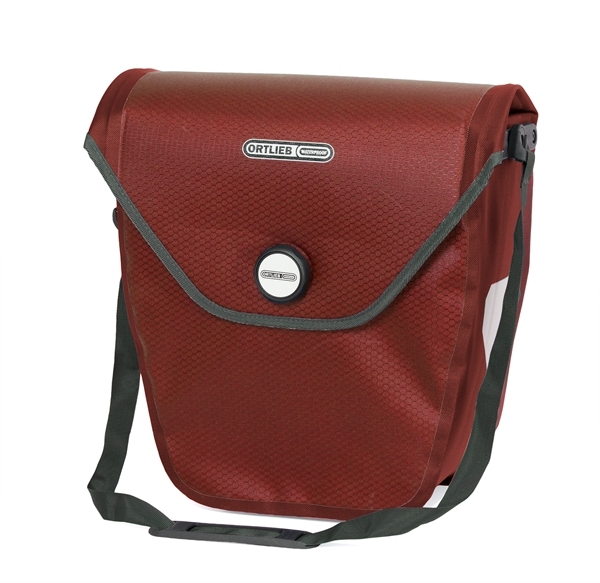 Product information "Ortlieb Velo-Shopper QL2.1 dark chili"
Do you like to take your bike shopping so as to avoid traffic jams and desperate searches for parking spots? And to get some good exercise and burn calories that you won't have to count when you return for dinner? No matter whether you need to take a quick trip to the supermarket in the evening or to the farmer's market on Saturday, your Velo-Shopper has a big hatch and an 18-liter payload. That's enough for a lot of stuff! And you can conveniently open and close the magnetic snap buckle with one hand. Made of waterproof, abrasion-resistant nylon fabric, the Shopper can be attached to your bike rack with the proven Quick-Lock2.1 system. And then simply sling the Velo-Shopper over your shoulder with the detachable strap when you reach your destination. Go ahead and fill the Shopper to the brim because its stiffened inside construction will help to prevent crushing. Related links to "Ortlieb Velo-Shopper QL2.1 dark chili"
Customer evaluation for "Ortlieb Velo-Shopper QL2.1 dark chili"